Last month, I joined the Patchwork Squared (P2) Solids Quilt-a-long hosted by Quilt Dad (Charlie Scott) and Ryan Walsh. I wanted the challenge of choosing solids, following instructions for new blocks and choosing quilting patterns to highlight each block. All the fabrics were selected from my stash. I did use a bit of artistic license and modify the blocks a little. This is my completed quilt made with an assortment of Moda (Bella Solids), Michael Miller and Kaufman (Kona Solids) fabrics. It was a fun quilt-a-long and I love the end result. Thanks guys and thank you Amy from Amy’s Creative Side for hosting the Bloggers Quilt Festival. 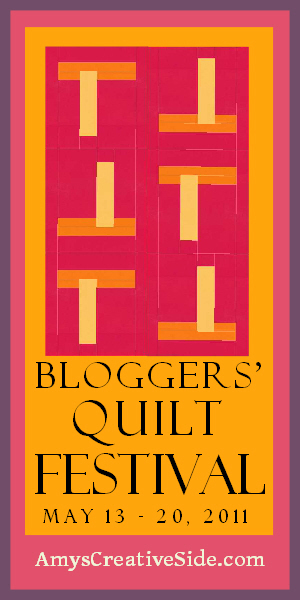 It is a great way for all us bloggers to share our love of quilting and projects that are special to us all. It looks really good! I love the splash of orange. It looks wonderful. I love the quilting embellishments, they really finish it off beautifully. That looks fantastic! I really like the colours you've used! This is great, you chose wonderful colours! I will make the last two blocks today and then assembling it next week. Have a wonderful weekend! Beautiful quilting and I love the colors you chose. JANE YOU ARE FAST!! I love what you did with this Quilt Along, making it your own! I still have a few blocks to make on mine, but yours turned out stunning! LOVE IT! I love the colours you chose. Fabulous quilt! So I see you did enter it! I put my comment before. Hugs. Looks Fantastic, I had too much on my Plate to join in with the Quilt Along, but I may have to make one down the track! This is really nice! I like seeing samplers and this made of solids is really cool! Who would have thought that such simple colors could make such a stunning quilt! Love your color choices. Love the colour combination you have chosen. It looks fantastic. I love it! I'm really getting into orange lately. What a stunnIng quilt! I really like the colours you've used! Beautiful!! I am always impressed with how effective quilts made with solids can look. Your quilt is great! That is a great quilt!